Your worldview is how you think about the world. The Christian worldview (or Biblical worldview) does not embrace the theory of evolution. 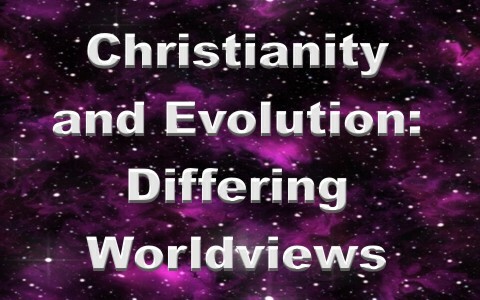 In fact, Christianity and evolution have differing worldviews as discussed below. Christians believe that God created the universe, the world, you and me, and every other good thing that exists. Evolutionists disagree; they believe that God had nothing to do with it. How they think they know that remains a mystery. Many simply say that there is no evidence for the existence of God and consider the matter settled. However, is it really that there is no evidence for God; or is it that they interpret the evidence in a manner that does not allow for the possibility that God exists? Evidence does not speak for itself; it must be interpreted. When scientists, secular or otherwise, discover something, they often do not immediately know what it is, where it came from, how old it is, etc. More research must be done in order to determine these particulars. Both secular scientists and creation scientist have the same evidence; the same physical, material universe of objects and functions, to observe. Nevertheless, the creation scientist allows for the possibility of God’s involvement in the universe. Creation scientists believe that God is the Source behind our origins, while the secular scientist attributes our existence to other, non-personal forces. The differing conclusions they each reach are the result of their respective presuppositions. The creation scientist allows for (often depends on) the reality of God’s existence to factor into his or her findings, while the secular naturalist will only allow answers that do not involve God or the supernatural. However, naturalistic scientist do allow for the existence of the unseen, the immaterial, and/or the untestable in their research. Bodie Hodge writes, “Logic, truth, integrity, concepts, thought…are not material and have no mass; so those holding to naturalism as a worldview must reject logic, truth, and all immaterial concepts if they wish to be consistent since these are not material or physical parts of nature” . However, we know that logic, truth, mathematics, etc. are necessary to perform the functions required in scientific research, hypothesizing, and testing. Often, secular scientists present Darwin’s scientific observation of the changes in beaks of Galapagos finches as proof for the evolution of one animal kind into another. The creation scientist readily admits that there indeed exist differences between Finch beaks; and therefore, he or she agrees with adaptation, or variation, within a species. However, to extrapolate that this observed variation translates into proof of evolution, or common descent, is an example of stretching an observed fact to the breaking point in order to support a preconceived theory. The micro-evolution that occurs with these Finch beaks does not prove the macro-evolution necessary to change one species into another species. The origins of man cannot be scientifically tested or verified. None of us were there. The reason that evolution cannot be proven is (beside the biblical view that it didn’t happen) that true science is based on observation and testing. Our origins cannot be observed nor tested. How then can secular scientists claim that they ‘know’ evolution occurred? Much of the confusion stems from the differences, and limitations, between operational science and historical science. Operational science is science where evidence can be observed and tested in the present. This type of science is characterized by experimentation that is observable, repeatable, and falsifiable. This involves the type of experiments that can be done in present time. Conversely, historical science concerns itself with the past. It is a philosophy; a theory about what might, or could have, happened in the past based on what we see in the present. Historical science is unobservable and unrepeatable. The theory of evolution is based on historical science. No one has been able to observe or repeat the making of life from non-life (matter giving rise to life or chemical evolution). No one has been able to observe or repeat the changing of a single-celled life-form like an amoeba into a cow or goat over billions of years (biological evolution). No one has been able to observe or repeat the big bang (astronomical evolution). In light of these facts, the theory of evolution should be considered to be a philosophy, not a ‘scientific’ theory? Granted, the belief that God created everything cannot be tested either; however, creation scientists readily acknowledge this fact. Nevertheless, the theory of evolution, which is based on unobserved, untestable ideas, is no more reasonable than the creationist’s belief in God. Evolutionists attribute our existence to blind unguided chance, while creation scientists attribute our existence to an all-powerful loving Creator. Neither belief can be proven with a test tube. Secular science posits that the processes we see today at work in nature have always worked the same way at the same speed with the same results since the beginning of time. Of course, this is unprovable; therefore, it will always be a theory. Granted, it is the best theory that naturalistic science, the discipline of science that only allows for material answers to their questions (no supernatural, or anything else other than the material universe) can come up with. This is not to say that secular scientists are not genuinely seeking answers; the problem is that, due to the fact that they refuse to recognize God’s rightful place as Creator and Sovereign, they are not in a position to recognize truth when they see it. If you disallow God as answer for your questions, it is a given that you must attribute any answer to something other than Him. This philosophy leaves humanity without hope of an answer for what truly ails us. More reading: How Do Christians Explain Evolution? Well done as always Robert! Very difficult to help the unbelievers who are convinced of the “rightness” of their worldview. Although I have listened to many naturalists, there is no room for God in a natural world where one is convinced that the supernatural does not exist. We can pray that the Holy Spirit breaks down the strongholds of their prison, but like the 83 year old friend of the family I mentioned to you, a devout naturalist… he died this past Fall having ceased any communication with me as I had plead with him to just take the gamble that God is out there. He refused…maybe in his last thoughts the Holy Spirit broke through. I like to think so. What does the naturalist gain by his/her unbelief in the supernatural? When death occurs they believe their consciousness goes on. Isn’t it ironic that “consciousness’ is immaterial and ranks with science, math, energy, and love in not having any material? They are all unnatural and yet the naturalist does not refute their existence. When death occurs they, like all of us, look for meaning. Why are we here, and what happens after death? It is so logical and so real to embrace an all loving God who created this incredibly fashioned universe. He created us to return Glory to Himself for all of His Majesty, partially revealed in His creation. We do that by turning from our sin and believing in His Son Jesus…His death for our sins…and believing in His Bodily Resurrection. I agree with you Robert that some evidence speaks to us based upon our worldview, but I also believe that most evidence speaks to all men, independent of their worldview or interpretation. Man is left without excuse for not only denying, but, in reality actually rejecting God, whose Hand they see continually. Men will not suffer condemnation because of their worldview. They are condemned already. All of us are (myself included). We do not have to remain condemned though. I found my rescuer from hell, and so can your readers. Jesus! I pray we all believe in Him today. As for the 83 yr. old friend of your family, I too have known those who have staunchly rejected Jesus right up to their deathbed; however, as you said, I hope and pray that they had a change of heart at that last second and that they are now with the Lord in paradise. Concerning whether or not God’s existence is apparent to all, you are absolutely right. I wrote an article about this very subject (http://www.whatchristianswanttoknow.com/do-atheists-really-believe-there-is-no-god/) where I present the biblical evidence for believing that everyone knows that God exists and, as you said, no one has an excuse for not repenting and following Him. You are also right about one not being stuck in their worldview; the power of God can change one’s foundational beliefs. As a matter of fact, those who remain dedicated to a naturalistic, Godless, worldview do so willingly and, I believe (and the Bible supports) in spite of what they actually know to be true. I am reminded of one time when I was reading someone’s commentary concerning this verse, “But a natural man does not accept the things of the Spirit of God, for they are foolishness to him; and he cannot understand them, because they are spiritually appraised” (I Corinthians 2:14), that the commentator (can’t remember who it was right now) said that this verse carries the idea that the unspiritual man is unspiritual because he willfully chooses to be that way. In other words, he ‘cannot’ understand the ‘things of the Spirit of God’ because he chooses to ‘not accept them’. God bless you, Doc. I am always challenged and humbled by your comments. I thank God for your commitment to Him and His kingdom. As I know that it is sometimes difficult to tell one’s tone in an email or comment online, let me assure you that everything I say is said with love and concern for you and anyone who might read anything I’ve written. Please do not take what I say as an attack on you, it is not. However, I am very concerned with those who reject God and who call into question the truth and veracity of the Bible. I understand that there are those who struggle with the issue of creation and evolution. That is the reason for articles such as this one. Let me first put your mind at ease by reassuring you, and others, that our salvation is through faith in Jesus Christ. Jesus died on a cross to pay for your sins and mine and, when as we repent and trust Him for forgiveness of sins, we are saved. I would like to respond to your comments by first including your comment and then addressing that comment. It seems to be the simplest way of responding to everything you’ve written. Thank you for your patience. As I wrote in the article, evidence must be interpreted. There is no evidence for evolution; there are only observable facts that evolutionists interpret as supporting their theory. However, creationists can also interpret the very same facts as supporting creation. Both evolutionists and creationists work with the very same “evidence”; however, they each come to opposite conclusion because they each begin with different worldviews (or presuppositions). The creationist attributes the existence of the universe to God while the secular evolutionist denies that God even exists. While your salvation is based on faith in Jesus Christ, creation and secular evolution are at polar opposites of one another. One says that God did it and one says that God had nothing to do with it. While not believing in creation may not affect your salvation it definitely affects your view concerning the authority of the Bible. The theory of naturalistic evolution tells us that the universe, and everything in it, came about by the operation of mindless forces. The Bible tells us that God created everything. This is an issue of authority; do we take fallible humanity’s word over God’s Word? Is our worldview formed from a study of the Bible, guided by the Holy Spirit working within us? Or do we allow some, who do not even acknowledge God’s existence, to coerce us into believing God had nothing to do with creation and has nothing to do with our lives now? My article is directed at those who do not believe God exists; therefore, they attribute creation to something other than God. It is not required that one views the Bible as a science book; however, when the Bible says that God created the universe, we should take that as the truth. Genesis clearly says that “In the beginning, God created the heavens and the earth” (Genesis 1:1 NASB). So, either we believe the Bible, that God created everything, or we believe those who reject God and say that everything came about by chance and random forces. I don’t think that a condescending attitude is what Jesus would have us have. We are all, believers and non-believers, created in the image of God; therefore, we all have God-given worth. I don’t see why there has to be any conflict between science and a belief in God. After all, as you mentioned, we are studying His creation. And I agree with you that we both agree that we exist in God’s created universe. It has been a pleasure talking to you and, if you have any questions that I might be able to answer, please feel free to ask.